So true dear, home made Pizzas are the best and urs is looking really good. 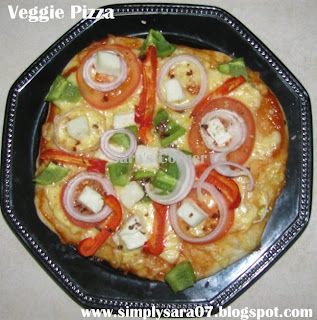 Yea Sara Homemade stuffs are the best.This pizza looks very yumm!!! Nothing will beat the homemade pizza, beautiful and great looking pizza..
Oh my pizza looks delish and yummy Sara..
true sara, we dont get good pizzas here and that too for vegetarien there is only one choice. have to start baking soon.